There’s been a lot of discussion in the media-sphere lately about the risks and rewards of Facebook for media companies and publishers of all kinds — a debate that was reignited at the recent Online News Association conference, where former New York Times social-media editor Liz Heron was put on the hot seat about Facebook’s impenetrable algorithm and its effect on the news business. It was simultaneously an admission of the network’s immense power and a revolt against the fundamental inscrutability of that power. Frustration with that reality has been building for some time now, as media organizations have come to realize that social is the new search — and so they are now just as beholden to [company]Twitter[/company] and [company]Facebook[/company] as they once were to [company]Google[/company], and the new bosses are just as opaque as the old one. You can see that frustration when people like NYU journalism professor Jay Rosen start trying to game the algorithm by pretending that it’s a personal update instead of a blog post, using words like “congratulations,” etc. Or when Facebook product manager Mike Hudack writes about how the news business has turned to crap, and is quickly besieged by media types who claim his company is to blame. Liz Heron told the ONA that trying to game the algorithm doesn’t work, and that the only real secret to getting lots of interaction from Facebook for your content is to create and post great content (this was always Google’s argument as well). But what is great content? That’s the existential problem media companies are wrestling with: is it clickbait that drives people to share, or is it in-depth analysis of important topics? And how do we know when we are succeeding? Part of what makes Facebook hard to figure out as a platform for news or content of any kind is that it’s a moving target. 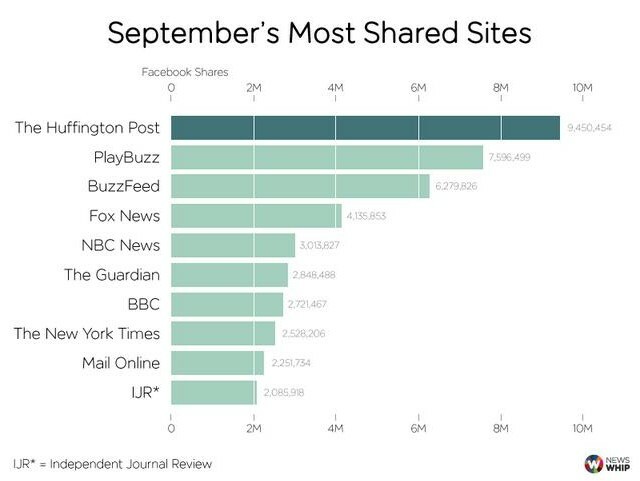 John Herrman at The Awl looked at the top publishers on Facebook as ranked by Newswhip, which tracks the most-shared content, and — depending on how you look at the future of online media — the results were more than a little depressing. What can Publishers Learn From This? A literal interpretation: SUBLIMATE YOUR IDENTITY ENTIRELY, EVERY MONTH, because nothing else works, and the next PlayBuzz or Viral Nova could appear tomorrow and just totally house you out of nowhere. In a post responding to some of the fears expressed at the ONA meeting and elsewhere about Facebook’s control, David Higgerson — digital publishing director at Trinity Mirror in the UK — wrote a post arguing that media companies need to “get over their fear” of the social network and figure out how to use it to broaden their reach and engage with new audiences in new ways. “Our job as journalists is to be part of that community and give people the content they want,” he said. Higgerson is right, of course. If you believe in the principle that former Reuters blogger Felix Salmon and his new boss at Fusion, Margarita Noriega, have described as “promiscuous media” — the idea that content, including journalism, needs to be created and distributed through multiple platforms if it is to be effective — then ignoring Facebook is unwise, and possibly fatal. News Corp. executive Raju Narisetti made a good point in a response to Higgerson’s argument, however, which is that by giving content to Facebook you are ultimately helping Facebook as much or more than you are helping yourself. How much value are they getting out of that relationship and how much of that is value that you could or should be capturing yourself? The bottom line is that Facebook is a corporation that ultimately has its own interests at heart, not those of the media industry or the journalistic community. To the extent that news organizations generate content that improves engagement on Facebook or generates data, then it will promote that content. If that stops working, then it will down-rank that content without a moment’s hesitation. There’s no better example of the dual nature of Facebook than the “social reader” experiments of 2012, when newspapers like The Guardian and the Washington Post created Facebook apps that allowed users to read their news on the site. At first, those apps generated huge increases in traffic — until Facebook changed its mind about promoting them, at which point they fell off the edge of the earth. Facebook may be cozying up to journalists and news organizations, because it sees their content as having value in attracting and keeping readers, but that is its only purpose. And anyone doing business with the network should keep that in mind at all times, just as the frog should have kept the scorpion’s true nature in mind in the old fable. Ultimately, it is a tool — one that can cut both ways. Hi Mathew, thanks for the link and comment. You’ve summed up my post far more effectively than I did: Facebook is a great source of traffic and will remain so for as long as it perceives users value news. The moment they don’t, and therefore Facebook doesn’t, will be the moment the news industry is facing a much bigger challenge than Facebook’s power over the media!